Craft cocoa bean-to-bar chocolate-making, on an artisan basis, is a long and painstaking process with numerous steps, many of them involving a scientific approach. Wild Sweets® By Dominique & Cindy Duby is ranked as one of the '25 Best Chocolatiers in the World' and awarded 'Best Chocolatiers & Confectioners in America'. As Canada's only artisan science-based cocoa bean-to-bar chocolate-makers, we produce locally sourced chocolate in Richmond (Greater Vancouver area) and work closely with the University of BC in Vancouver on various research projects relating to the science of chocolate-making within Wild Sweets® micro-batch laboratory settings and small-scale machinery. The cocoa beans are hand-sorted on a vacuum shaker sieve to remove debris such as stones, twigs, and other unwanted elements such as underdeveloped and/or damaged cocoa beans. The cocoa beans are roasted using one of the most technology advanced roaster in the world offering us total control over the roasting process (from drum speed to exhaust and all temperatures are measured by digital probes and PID controllers). Each roasting has a specific time and temperature cycle depending on the type of cocoa bean (for example, Criollo or Trinitario), bean size and natural acidity level of the varietals. The whole cocoa beans are cracked into small pieces, which are called “nibs” at this stage, while being separated from their lighter outer husks though a gravity vacuum system. Typically, around 30% of the initial weight of the cocoa beans is lost at this stage. The roasted cocoa nibs are loaded into a shearer-refiner, a machine that heats the nibs to a specific temperature while agitating and shearing until they become liquid. The heating and atmospheric aeration produce a gas phase whereby moisture and acids (mostly acetic acid) and other unwanted aromas become volatile (and are removed during degassing). The cocoa liquor is mixed with organic cane sugar and this chocolate mixture is conched — a process similar to massaging — for up to 72 hours at low speed while being exposed to a “curtain” of HEPA-filtered warm air. Coaching reduces bitterness and “cements” the cocoa-sugar agglomerates which in turn allows further development of the inheriting (that is, the varietal specific) chocolate taste and aroma. Like fine wines, premium chocolate is cellared to develop its taste. The conched chocolate mixture is left to age in a controlled environment for up to 6 months. During this time, there will be reactions between flavour compounds within the chocolate mass. This will enhance the taste profile, or may even contribute to a new profile. The warm, liquid chocolate must go through a heating and cooling process at a very specific temperature range in order to crystallize it into a stable form. This is an extremely precise process. It develops the proper crystalline matrix of solid cocoa butter and completely changes the quality attributes of a finished solid chocolate bar, including hardness, gloss, contraction, pace of solidification, flavour release, resistance to fat bloom, and heat tolerance. The tempered chocolate is deposited into moulds, shaken on a vibrating table to remove air bubbles, and then left to crystallize in a cooler. When the chocolate is perfectly set and contracts from the moulds, the bars are unmoulded in preparation for packaging. All our chocolate bars are packaged in a special custom-printed foil bag that is moisture-proof, airtight, and light-proof. This protects the product from surrounding odours (air) and reduces fat bloom damage from light exposure. Fat bloom damage can only be avoided if the chocolate product is stored at a constant temperature of 16°C/60° F or less. Wild Sweets By Dominique & Cindy Duby Vintage Bean-to-Bar chocolate is not only produced on an artisan basis, it is also scientifically standardized. Most Standard Operating Procedures (SOP) have been scientifically validated for small-scale production and continue to be researched for improvements. Ongoing research has contributed to standardization procedures for many of the production steps. We conduct many measurement tests in our laboratory, and measure acidity and titratable acidity (pH meter), moisture (microwave vacuum dryer), particle size (digital micrometer), temperature (digital and/or infrared thermocouple), crystallization (automatic refrigeration cycle), microbiological factors (an outside laboratory tests for TPC, coliform, etc.) We carry out various flavour-evolution tests (for example roasting patterns, cocoa liquor profile) using scientific procedures and small laboratory equipment such as the heated magnetic stir plate, centrifuge, and thermo-circulator. COSTA RICA MALEKU: The name Maleku comes from a population native to the northern plains of Costa Rica, between the Arenal Volcano and Costa Rica’s border with Nicaragua. 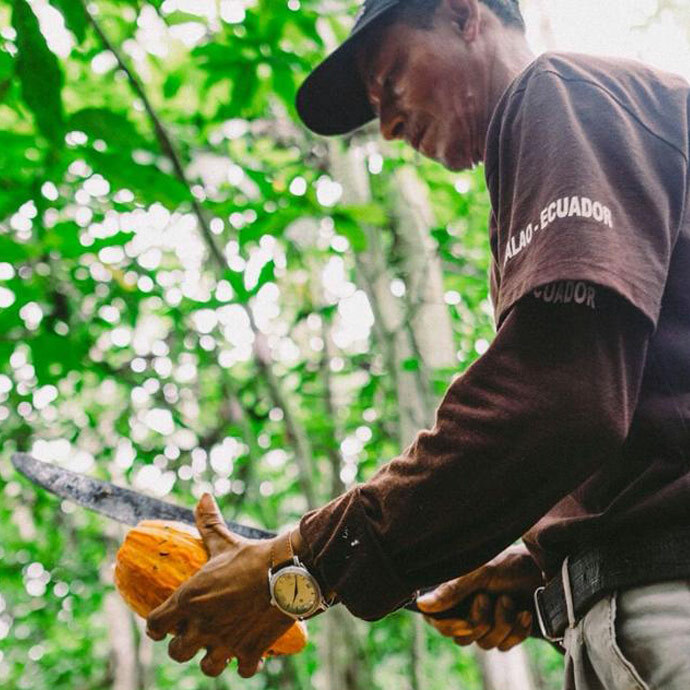 Nahua works closely with 240 smallholder cocoa farmers in the area, sourcing pods from native trees, which tend to be a mix of Trinitario and Criollo. Many of the plantations are quite remote, the oldest of which lie along the banks of rivers that flow into Lake Nicaragua. ECUDOR CAMINO VERDE is a privately owned fermentary located in Duran, just minutes outside Guayaquil, Ecuador. They have built a passion for impeccable quality and consistency in beans, as well as an understanding of the applied science in cocoa fermentation that pushes the boundaries for new-age methods of cocoa post harvest processing. Camino Verde’s owner, Vicente Norero, has years of experience in microbiology, which brings a unique approach to cocoa processing. TANZANIA KOKOA KAMILI is a Cooperative that currently works with approximately 1,500 small shareholder farmers, most of whom farm between 0.5-2 acres of cocoa. Kokoa Kamili pays a premium – well above the market rate – to farmers for their ‘wet’ cocoa, and conducts its own fermentation and drying. By taking over the fermentation and drying process, Kokoa Kamili can produce more consistently higher quality cocoa beans. This method gives farmers a reduced workload, along with greater compensation, and the farmers are paid immediately after the cooperative receives its wet beans. Region: Mbingu Village, Morogoro Region. Fermentation: in locally sourced and constructed eucalyptus three tier boxes for 6-days with turns on days three and five. Drying style: 100% sun dried on raised drying tables with combination of direct and indirect sunlight. TRINIDAD GRAN COUVA - Montserrat is a farmer-owned and run cooperative whose primary goal is helping to revitalize the local cocoa industry and improving the quality of life for its farmers through its higher bean price. The co-op began in 2009 when 5 farmers and grew to its current pool of 48 large and small farmers. In 2016 the co-op became the first organization in the English-speaking Caribbean to receive certification from Rainforest Alliance. This is a significant step in the evolution of this farmer-led effort and its goal to produce a large quantity of beans that are high in quality and overall standards of operation. DOMINICAN REPUBLIC ÖKO CARIBE is a fermentary founded in 2006 by Gualberto Torrejon and Adriano Rodriguez, two cacao professionals with extensive experience in cacao production throughout Latin America. Öko Caribe purchases wet beans, pre-selected for quality protocol and delivered to the fermentation center in less than 6 hours from harvest, from about 165 smallholder farmers, which are then fermented and dried within their own centralized processing facility. *Note that there are two grades of cacao in the Dominican Republic: Sanchez, which refers to unfermented cacao sold to commodity markets, and Hispaniola, which refers to cacao that has been treated to controlled fermentation. MADAGASCAR BEJOFO ESTATE is an organic cacao orchard that makes up one part of the 2000-hectare Akesson Estate in northwest Madagascar’s Sambirano valley where the soil and climate are ideal for growing high quality cacao. Akesson’s Estate is divided into four smaller estates--Madirofolo, Menavava, Bejofo, and Ambolikapik. It is managed by Bertil Akesson, who has specialized in growing ﬁne cocoa for many years. 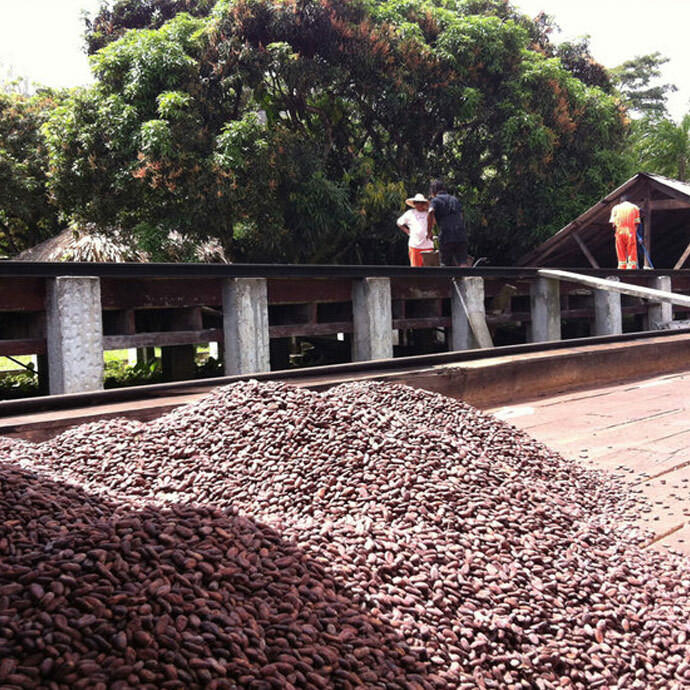 Bejofo Estate produces 300 tons of cocoa a year or about 10% of the country total production. Region: Sambirano Valley, Ambanja District. UCAYALI RIVER CACAO is a central fermentary that works with around 400 smallholder cocoa farmers (1-to-3 hectares of land each) along the sandy clay soil of the Ucayali River outside of the Peruvian city of Pucallpa. Ucayali River Cacao buys wet cacao at a premium price – most are Trinitario clones as well as what the locals call “comun”, which is a varietal similar to Trinitario, but lower in bitterness and astringency – that are then fermented and dried within their own centralized processing facility using techniques learned under Daniel O’Doherty of Cacao Services.